RIO DE JANEIRO, May 30 2013 (IPS) - Brazil, and especially the city of Rio de Janeiro, is experiencing a boom in bus rapid transit (BRT), a public transport system that now has an internationally-recognised quality standard. 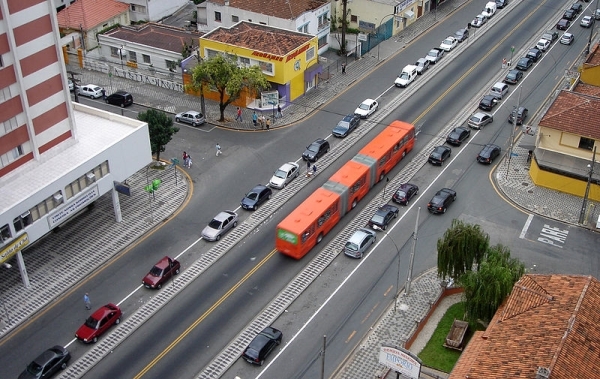 According to Brazil’s National Association of Urban Transport (NTU), there are 113 BRT projects in 25 cities, with 1,270 kilometres of dedicated bus lanes. By 2016 they should all be operative. “BRT is the star of sustainable transport; it is an environmentally friendly, economical solution for big cities that have serious congestion problems,” Helena Orenstein, the country director for Brazil of the Institute for Transportation and Development Policy (ITDP), told IPS. The system does not exclude other methods of transport; on the contrary, it creates an integrated network of different kinds of transportation, Orenstein said. But a common definition and quality assurance were previously lacking, she added. The ITDP helped formulate quality guidelines known as the BRT Standard, in partnership with a commission of experts and various organisations. The BRT Standard, launched in March, analyses and gives points for 32 items divided into six categories, such as service planning, infrastructure, integration and access, as well as others which carry negative points, like overcrowding or lack of maintenance. The result is a tool with common parameters of quality control for BRT all over the world, which will also guide and motivate improvements in these transport systems, according to Orenstein. “The idea is that BRT should deliver an excellent form of transport, paying attention to the requirements of safety, comfort and practicality. It’s about time people no longer had to waste three hours a day to commute across cities,” said the head of the Brazilian office of the ITDP, an NGO that offers technical support in a number of countries. The quality certification functions as a checklist that adds or subtracts points and is easily understood by authorities, consultants and operators. The BRT Standard issues bronze (55-69 points), silver (70-84 points) or gold (85-100 points) certificates. The aim is “to certify BRT systems that are already operating in order to correct any flaws and reward good examples,” Orenstein said. Pedro Torres, the ITDP’s urban development manager in Brazil, explained that a technical committee would carry out annual reviews and updating of the certifications. Following pilot trials in 2012, the first full certification exercise this year analysed 67 BRT systems in 41 cities in Argentina, Australia, Brazil, Canada, China, Colombia, Ecuador, France, India, Indonesia, Mexico, Peru, South Africa and the United States. Twelve of them were awarded gold certificates, 28 silver and 24 bronze. Among those that won gold, the highest points were earned by the Zhongshan Avenue BRT in the Chinese city of Guangzhou; four TransMilenio services in Bogotá, Colombia; and the Linha Verde (Green Line) in Curitiba, the Brazilian city that pioneered this type of mass transport in 1974. “It was a very positive experience. It’s an opportunity for society, governments and companies to have a public evaluation and monitoring tool for these systems,” Torres told IPS. The head of NTU, Otávio Cunha, praised the BRT Standard initiative and said the NTU has passed the list of items to be evaluated on to its members. “We are in favour of dedicated bus lanes as a sustainable transport option that has a higher cost-benefit ratio. The idea of a quality standard is a good one,” Cunha told IPS. Traffic creates stress, increases the accident rate and causes economic “disbenefits” because of the waste of fuel and time involved in urban transportation, he said. “Brazil is going through a mobility crisis and there is too much fuel and time wasted in cities because of traffic. Dedicated bus lanes can make journeys faster. BRTs are a new concept in surface public transport, inspired by the requirements for excellence in underground rail systems,” he said. A dedicated corridor can transport 10,000 passengers an hour by bus, compared to only 750 by car. A bus can take all its passengers on board in barely 15 seconds before leaving a station. In many cities, the time interval between buses can be as little as 20 seconds, making the service highly efficient. In Brazilian BRT systems, the interval between buses may be two minutes, Cunha said. One busload of passengers can replace 120 cars, he said. Another benefit is the reduction of greenhouse gas emissions from vehicle traffic. In Mexico City the BRT system, which is 20 kilometres long, has reduced the amount of carbon dioxide emitted from traffic by 80,000 tonnes a year, according to the ITDP. Constructing BRT systems takes time and money, but much less of both than a subway line, which can take up to 10 years to build. Building and equipping 10 kilometres of BRT takes an average of 18 months and 10 times less money than a metro line. Brazil’s 113 BRT projects, operating in 25 cities, represent 30 percent of total BRT systems already functioning all over the world, according to NTU estimates. The government’s current investment commitments amount to six billion dollars, including what it has already spent. By the end of 2013, more projects in medium-sized cities will bring the total to nearly nine billion dollars. Four new BRT projects are under way in Rio de Janeiro: TransCarioca, with 39 stations, which is to be inaugurated in December at a cost of 900 million dollars; TransBrasil, with 25 stations, which began to be constructed in 2012 at a cost of 600 million dollars; TransOeste, with 64 stations, the second phase of which will be completed in August, at a cost of 380 million dollars; and TransOlímpica, with 18 stations, which is due to begin operating in January 2016 at a cost of 1.1 billion dollars. TransOeste was awarded a gold BRT Standard classification, in spite of problems with overcrowding and poor road surfacing along some stretches of the bus corridor. However, Torres said, the average journey time was halved from two hours to one, and TransOeste has new units with air conditioning and onboard cameras, is accessible and offers frequent service. TransBrasil promises to be one of the biggest rapid transit corridors in the world in terms of passenger numbers, transporting close to 820,000 passengers a day, according to the project.